Not since my mother recited the “Little Piggy” rhyme and tickled my (then small) feet have I focused this much attention on my left pinky toe. At the moment, it’s not saying “weeee”. And, according to a senior Rolfing practitioner I consulted, it’s not saying much at all. Rolfing, unlike much of Western medicine, considers the body as a network of tissues rather than a collection of separate parts. I wanted to learn if there was something going on elsewhere in my body that was contributing to my persistent tendonitis. Were my hips out of whack? Even my shoulders? Frustrated by my lack of progress a full year after walking the Camino de Santiago, I didn’t want to rule out anything. The Rolfer watched me walk around and then had me lay on a table. She carefully palpated my feet and the nerves that connected my left foot to my pubic bone. Her conclusion? The most wee of my digits is asleep. To rebuild the muscles across the top of my left foot, which will relieve pressure on the tendon along my arch, I will need to wake up that little piggy. I greeted her opinion with both relief that the rest of my body was aligned, and chagrin that the remedy would involve tedious exercises I’d avoided in the past. Indeed, a year before I walked the Camino, my yoga instructor reminded me at each class to “activate” my feet. At the time, I didn’t fully listen, believing that other parts of my body (like my tight hips) required more attention. Since my feet didn’t hurt and I was able to complete strenuous hikes, I wasn’t highly motivated to do daily toe exercises. While necessary, these don’t release sweat, endorphins or other satisfying substances, or even give rise to bragging. Toe strengthening and flexing doesn’t usually enter the conversation, unlike pounds lifted, miles raced and altitude reached. We’re talking mini movements of muscles that, unless one is a dancer, are likely below the radar. A fully functioning foot is much like a hand, able to twist and reach, the toes moving independently of one another like antennae, sensing the environment and sending that information back to the central nervous system. In our shoe-oriented culture, we squeeze feet into tight boxes where, unless we’re careful, the toes atrophy and the soles “forget” how to breathe and feel the ground beneath. Imagine what your hands would be like if you wore stiff mittens all the time; you probably wouldn’t be able to give someone the finger, for example, or easily make an “A-OK” sign. While I don’t aspire to curse someone with my toes, what inspires me to gently, and painstakingly, coax life back into my left pinky toe is not just the desire to hike again but the fear of ending up with feet that have curled into claws. As I get older, that possibility terrifies me more than most other age-related changes, including sagging breasts and buttocks. “Feel the foot. Sensation is your friend!! !” reads the first line of instructions the Rolfer handed me at the end of my visit. 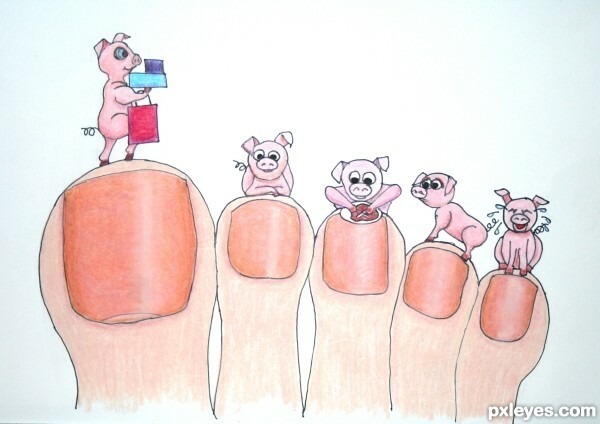 As I conduct my daily foot regimen, I might just start singing “This Little Piggy” again and tickle my toes. It can’t hurt and, if I’m lucky, the rhyme might accelerate the awakening of my left pinky from its long slumber.